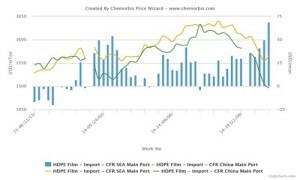 European PS suppliers returned to the regional markets with rollover requests for November on the strength of unchanged styrene contract settlements as per the pricing service of ChemOrbis. West European sources started to seek rollovers or even €10/ton gains initially in markets including Turkey and Italy to preserve their margins. Meanwhile, buyers don’t exclude the possibility of slight decreases during the latter part of the month, pointing to discouraging buying interest region wide. In Turkey, two West European PS producers revealed rollovers from last month. “We received a few inquiries which we think we will be able to convert to sales, albeit for limited tonnages,” a trader offering on behalf of a West European producer stated. He attributed stable styrene contracts to stronger spot styrene costs. “However, December contracts may fall if energy costs remain on a bearish path,” he predicted. Meanwhile, a Turkish converter expressed his GPPS buy idea much below initial announcements and commented that the latest European prices are not workable. “Chinese and Far East Asian markets are constantly falling given the decreasing energy complex. Buyers who are active in the disposables and insulation markets are about to enter the low winter season,” he noted justifying his weak view. In Italy, a West European PS producer initially asked for a €10/ton increase for November to maintain their margins on short monomer supplies before stepping back to a rollover. “Demand had picked up last month since there were less import cargos due to the unsupportive euro/dollar parity but it is not so encouraging now,” a source at the producer stated. A distributor maintained his West European PS prices in accordance with his supplier’s guidelines. “We are yet to manage to sell any material so far but we can’t apply any discounts for the moment considering our poor margins,” he explained. A disposables converter was offered South European HIPS with a €20/ton drop and attributed this drop to €100/ton lower butadiene settlements. “We heard that prices may decrease further in the second part of the month as some import PS cargoes are said to be coming to Italy from Korea,” he noted. Similarly, a food container maker did not exclude the possibility of a slight downwards adjustment citing calm activities. 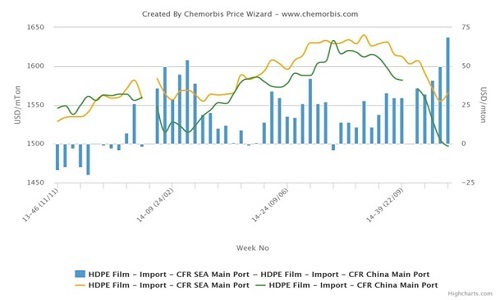 According to ChemOrbis, in Europe, November benzene contracts settled €110/ton lower while ethylene contracts were down €90/ton from October, driven by remarkable losses in energy costs. However, styrene contracts defied lower monomer settlements and held stable, owing to rising spot styrene figures during October amidst supply tightness stemming from Shell’s force majeure.